Today is my final day in Jeju do. I am flying back to Busan the next morning. There are many places I don't have chance to visit. I can't squeeze them all in my 4 days 3 nights trip to Jeju. I believe in enjoying the place and view. I normally spent more times to explore and understand the place I gone to. Yup! I am a sentimental woman. I woke up early morning and my first itinerary is to visit this Jeongbang Waterfall which is only about 5 minutes from the place I stayed. So close. 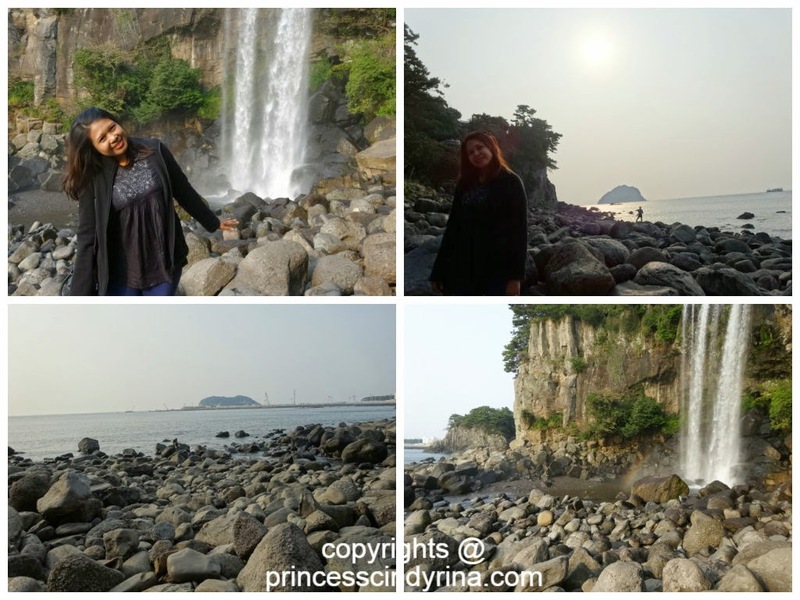 How to go to Jeongbang Waterfall? Jeongbang Waterfall, falling from a cliff, is 23m high and 10m wide. 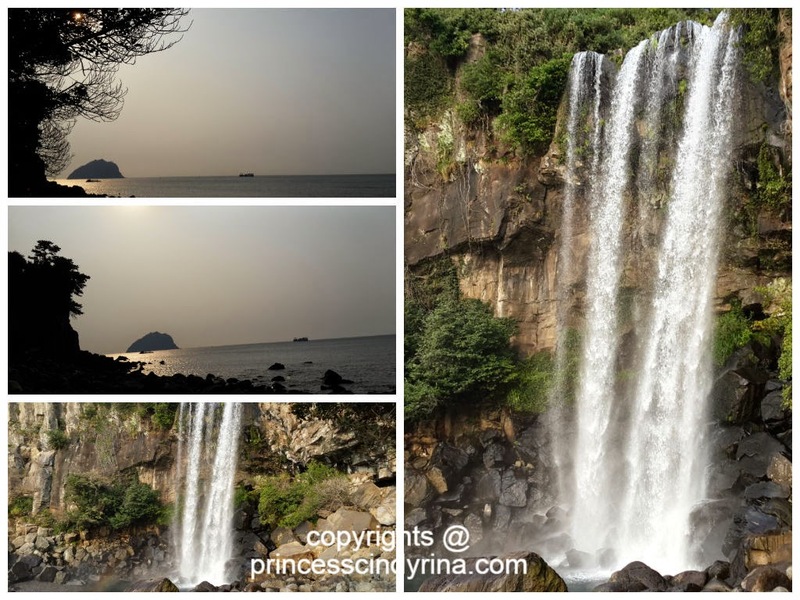 This is the only waterfall in Asia that falls directly into the ocean. 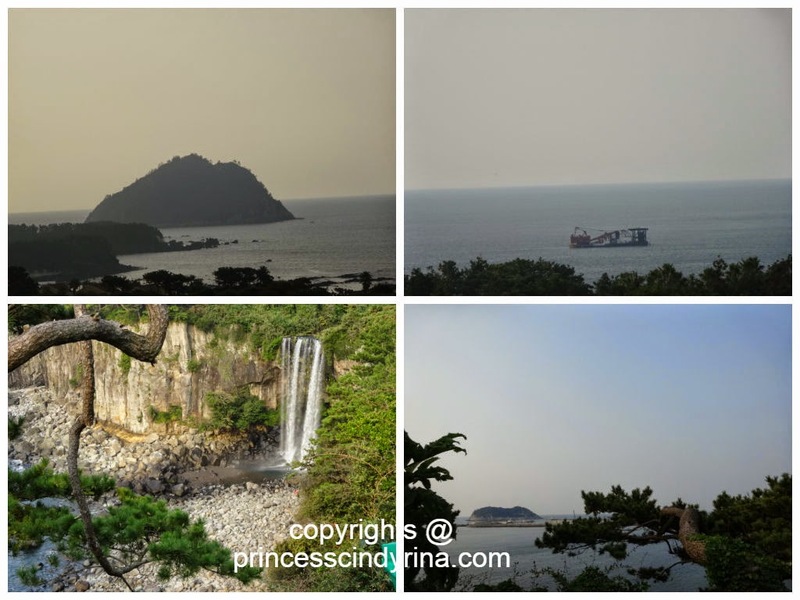 It is called Jeongbang-hapoak due to its picturesque scenary when view from a boat. 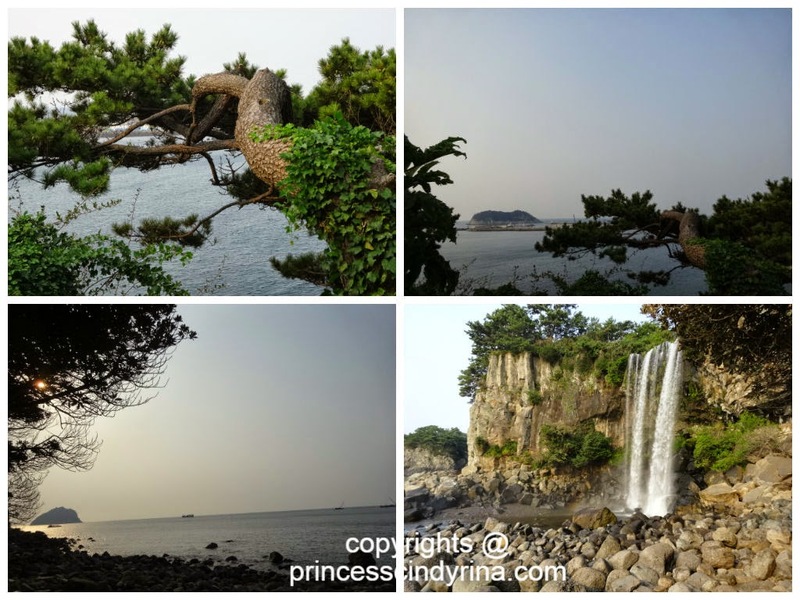 This is one of 10 'scenic wonders' in Jeju. The waterfall starts from Jeongmosi and it is said that if people play a drum and jang-gu at the point of water drops, turtles come up to the surface and dance on the water. Well, how true is this claim? IMA don't know because IMA don't bring a drum or Jang-gu to check of the truth. Jeongbang waterfall also famous with another legend of Seobul who is one leg man of Shi Huangdi during the Qin Dynasty. He was a servant of the Chinese Emperor Jin (BC259-210). He came to Mt Halla in Jeju to search for an 'elixir' for eternal life. He failed to find any. He then carved 'Seobulwagi' which referring to Seobul passing by this place on the cliff of Waterfall and subsequently he returned to the West where he come from. Nice to imagine this story back then those day when you read this kind of legend. Errrrr....I should have written down 'Cindyrina' was here on the Jeongbang waterfall. Damn! how could I forgot to do this??? 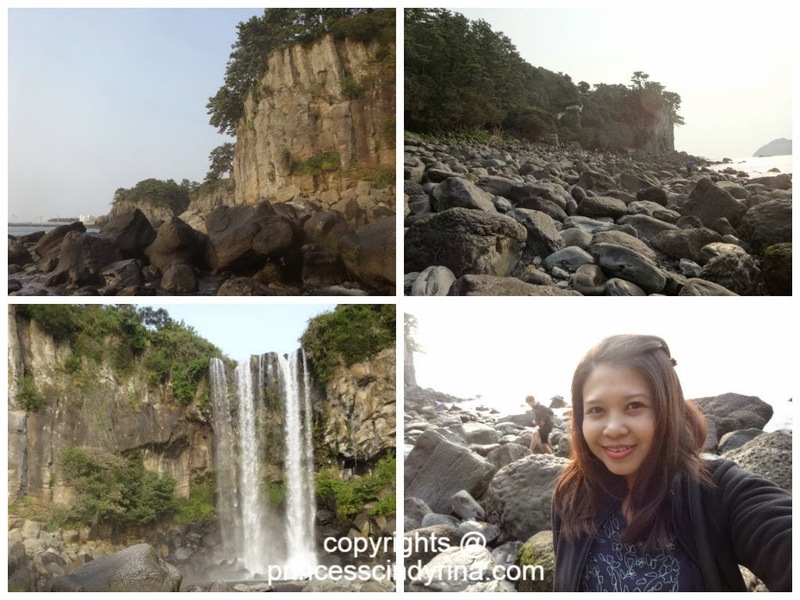 100 years later the Jeongbang Waterfall history may change because of me. mmmmmm...too late or I could go the again? Perhaps??? If go east for about 300 meter one can see another waterfall called Sojeongbang Waterfall which has a great place to relax. There is an observatory at the top of the cliff which one can see a beautiful scene of the sea view. 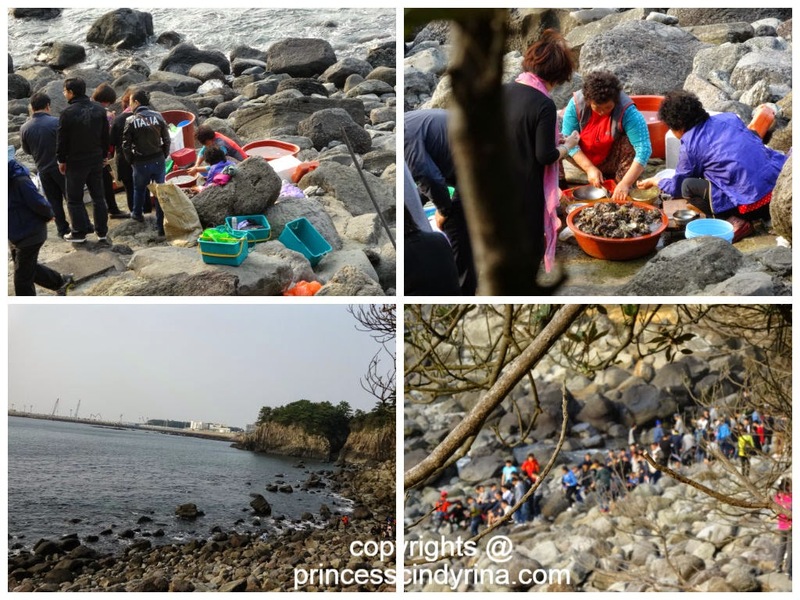 Those Ajumma is selling fresh catch of oyster! Too early in the morning for me to eat this fresh raw oyster, right? God knows how I feel when I witnessed this view before my eyes! The feeling was like wanna sit on one of those rocks by the sea and listen to the falling waterfall sounds. Ahhh!!!! suddenly all those poetry running around my head waiting to be penned down onto my shabby little note book. hahahaha...so poet! Calm sea with fabulous scene. The Ajummas attending to customers. Suddenly the peacefulness at Jeongbang Waterfall was disturbed by flocks of students came out of nowhere. Well...its time for me to move on to my next place of the day. Right opposite of Jeongbang Waterfall entrance, you can see this posh style Cafe DropTop. I wish I stay there long so I can enjoy sitting there drinking coffee and finish up my book.This place really have a breathtaking view. 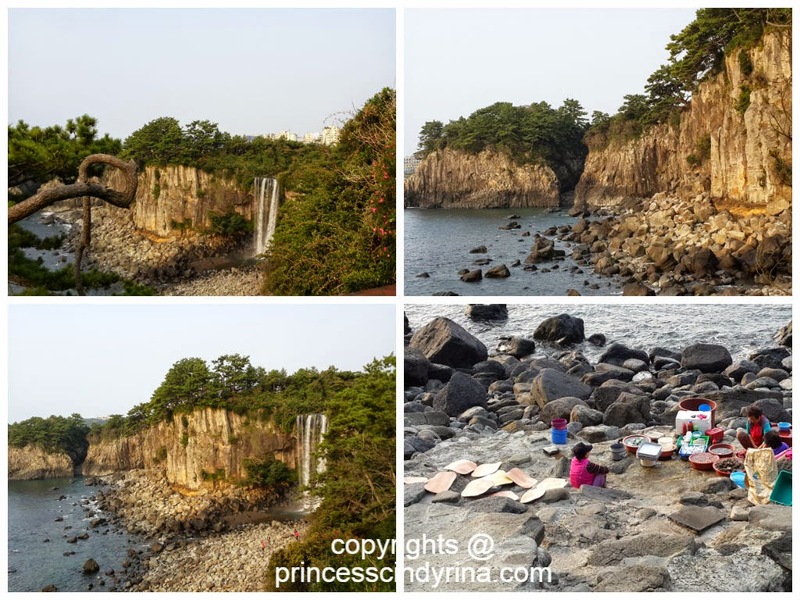 Some bloggers wrote this Jeongbang Waterfall view just another waterfall and the view is like ....meeehhhhhhh!!! I have seen this before! Well...if you travel just for the sake of taking photos without understand the story and the specialty of each places you visited then its not worth to travel so far and feeling mehhhhhh! Understanding and appreciating the beauty of each places is very important when travel to new places. Now you understand why I love to travel alone??? can swimming in that waterfall?? 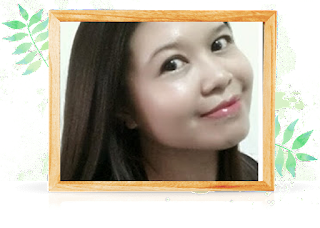 Gosh, can't get enough of your Korean posts! Makes me wanna revisit!